In the race to feed a growing population, it is important to consider sustainability. University of Illinois researchers are promoting the practice of agroforestry—the intentional planting of trees and shrubs with crops or livestock—to achieve sustainability goals. A number of practical and policy challenges have prevented adoption of agroforestry practices on a large scale in the U.S. If adopted more widely, agroforestry could benefit wildlife, soil and water quality, and the global climate. Feeding the world's burgeoning population is a major challenge for agricultural scientists and agribusinesses, who are busy developing higher-yielding crop varieties. Yet University of Illinois researchers stress that we should not overlook sustainability in the frenzy to achieve production goals. More than a third of the global land area is currently in food production. This figure is likely to expand, leading to deforestation, habitat loss, and weakening of essential ecosystem services, according to U of I agroecologist Sarah Taylor Lovell and graduate student Matt Wilson. To address these and other problems, they are promoting an unconventional solution: agroforestry. Agroforestry is the intentional combination of trees and shrubs with crops or livestock. Or, as Wilson simply puts it, "You stick trees or shrubs in other stuff." Alley cropping: field crops planted between rows of trees. Silvopasture: trees added to pasture systems. Riparian buffers: trees planted between field edges and river edges. Windbreaks: trees planted adjacent to planted fields and perpendicular to the prevailing wind pattern. Forest farming: harvest or cultivation of products—such as mushrooms, ginseng, or ornamental wood—in established forests. Each of the five practices can benefit conventional and organic agroecosystems in similar ways. Woody plants can provide habitat for beneficial wildlife, prevent soil erosion, sequester atmospheric carbon, and absorb nutrient runoff while providing farmers with additional streams of income in the form of lumber or specialty products like nuts or berries. Each specific practice also provides unique benefits. For example, trees added to pasture landscapes provide shade to grazing livestock. Farmers might be concerned about the trees casting too much shade on crops, but it is simply a matter of choosing the right complement of species. For example, the combination of winter wheat and walnut trees in an alley cropping system works well. "Winter wheat grows in the late winter or early spring, but the walnut doesn't leaf out until late spring," Wilson explains. "So, when you mix the two together, you've got the benefit of having two crops growing in different parts of the year." Lovell adds, "The grain crop growing near the trees can actually force the trees to grow deeper roots. This can benefit individual trees because the root zone they're forced to occupy gives them greater access to water." European farmers are ahead of their U.S. counterparts in terms of their adoption of agroforestry practices. "It's very common in Europe. A lot of farmers are already doing hedgerows, which are similar to windbreaks, as part of their agroforestry systems, and even more integrated systems are fairly common," Lovell says. Wilson suggests that there are cultural barriers to adopting agroforestry practices in the U.S. "We've had some farmers share sentiments like, 'why should I plant trees? My grandpa spent his whole life tearing trees out so he could put crops in.' There's definitely some perception that trees are not good in a farm landscape. Trying to overcome that has been a challenge," he says. Another obstacle in the U.S. is a policy mindset that treats production and conservation as completely separate functions of the land. For example, farmers are prohibited from harvesting or selling products from land designated for conservation, as in the USDA's Conservation Reserve Program. There are USDA programs that support certain agroforestry practices such as wind breaks, but government support for more integrated practices is generally lacking. That's why Lovell's team is advocating for farmers to utilize marginal land. "We are working with farmers to identify lands that are less productive, sensitive, or marginal, and suggesting those as the places to start transitioning," Lovell explains. Or, she suggests, farmers could plant young "edibles" (trees and shrubs bearing fruit or nuts) in a CRP easement. By the time the CRP lease expires in 10 to 15 years, the trees would be mature, bearing edible—and potentially profitable—products. 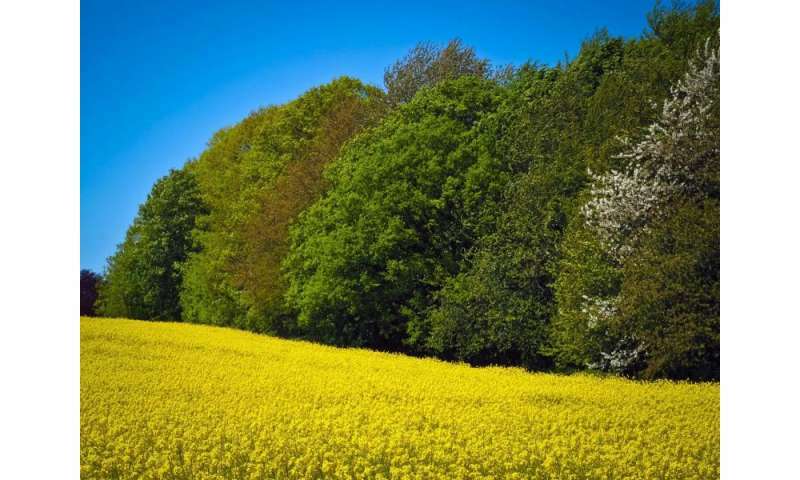 The long timeframe needed for trees to establish and mature may discourage some farmers, but the researchers offer a strategy for the transition period. In an alley cropping system with hazelnut and chestnut trees, for example, they suggest growing edible shrubs and pasture between rows. Farmers can expect to start harvesting and selling hay almost immediately, and will start seeing fruit production from the shrubs within a couple of years. Eight to ten years after establishment, trees will begin producing nuts. "We're looking at economic strategies to maximize profit from the very beginning," Lovell says. Despite the challenges, the researchers insist the environmental benefits are worth the trouble. "If you have trees in a system, you're holding soil, preventing runoff, and ameliorating greenhouse gas emissions. At the same time, you are getting a harvestable product. This combination of environmental services and agricultural production makes agroforestry an exciting opportunity to both feed the world and save the planet," Wilson says.